The kabuki actor Ichikawa Kodanji IV as Iwasa Matabei (founder of Ukiyo-e), surrounded by his paintings whiich have come to life (actors costumed as typical Ōtsu pictures of legendary characters). In Kuniyoshi From the Arthur R. Miller Collection it says on page 29: "[This diptych] was one of Kuniyoshi's most notorious works, on a par with the Earth Spider triptych of 1843. Like the artist's slightly earlier 'self-portrait' triptych [of 1848]... it ostensibly featured the legendary painter Ukiyo ('Floating World') Matabei, who was thought to have invented the kind of popular souvenir painting known as 'Ostu pictures' (Otsu-e). Matabei's paintings were so vivid, it was said, that the characters portrayed came to life. 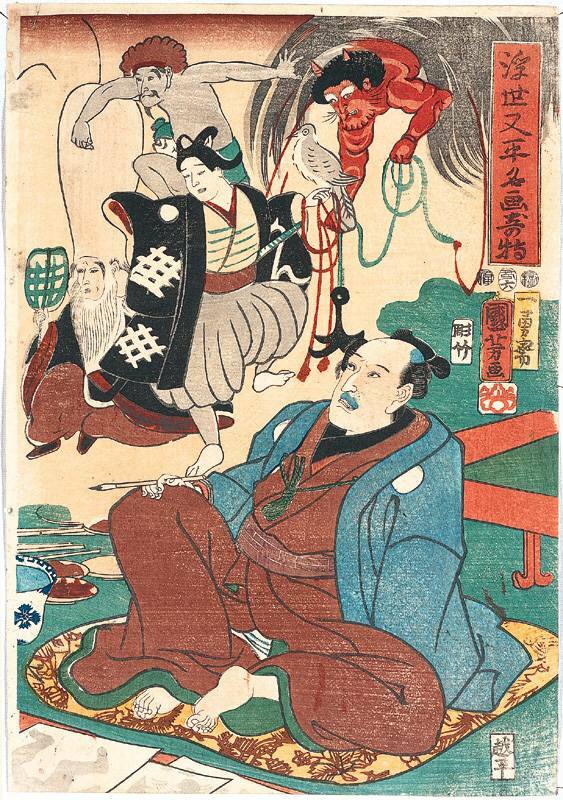 In the diptych, as in the print of 1848, Kuniyoshi grafted 'likeness pictures' (nigao-e) of Kabuki actors onto all the figures, including Matabei, seated on the right, who appears in the guise of Ichikawa Kodanji IV. As noted above, by the eleventh month of 1846 the authorities were tacitly agreeing to the renewed publication of actor prints, so censorship on these grounds was no longer an issue either in the triptych of 1848 or the diptych of 1853. City Prosecutions records that the block-ready drawing for the Matabei diptych was approved by the censors on the sixth day of the sixth month, 1853, and that it went on sale in the middle of that month. Fujiokaya nikki states that it was available for purchase from the eighteenth day of the seventh month, and that from the first of the eighth month sales exploded. Sixteen hundred impressions were being printed every day to meet the demand. Examination of surviving impressions confirms that the print must have been produced in very large quantities. The Miller Collection contains impressions from two quite different sets of blocks. The first... thought in good condition, with bright, unfaded colours, exhibits white gaps between the brown of Matabei's robe and its outline - an imprecise fit testifying to block wear. [This is very close to the diptych in the Lyon Collection.] The Museum of Fine Arts, Springfield, Massachusetts, owns an extremely late impression, taken after many more thousands had been printed and the blocks had become considerably more worn. Many of the outlines have disappeared completely and the colour blocks are fitting very badly.... Recut editions could be produced by sacrificing impressions of the prints, using these, rather than new block-ready drawings, to carve a fresh, almost line-perfect set of blocks - a technique known as 'overlaid carving' (kabuse-bon. Printing from several sets at the same time obviously expanded the quantity of impressions at a rapid rate. The Matabei diptych owed much of its extraordinary success to the timing of its publication. On the third day of the sixth month, 1853, a squadron of four US battleships under the command of Commodore Matthew Perry had steamed into Urga bay and rumours of a 'foreign invasion' reached the city the following day. In a detailed discussion of the print in relation to these momentous events the historian Minami Kazuo doubted that Kuniyoshi would have had time to design a print in response to the Americans' arrival and present it to the censors by the sixth day of the month, but the matter is surely open to question. Another key factor in the work's popularity was the unexpected death, on the twenty-second day of the sixth month, of the twelfth shogun, Tokugawa Ieyoshi (1793-1853), who period of rule, starting in 1837, had been dominated by the hated Tenpō reforms. 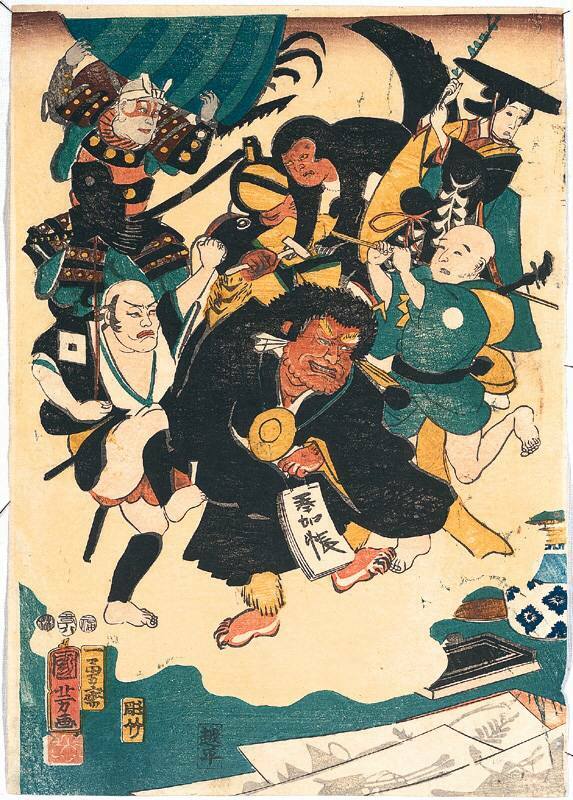 His passing destabilised an already tense situation, and, as they had ten years earlier with the Earth Spider triptych, people began reading into Kuniyoshi's image what they wanted to see. Perhaps Ukiyo Matabei represented Tokugawa Nariaki (1800-1860), lord of Mito? Maybe the Young Falconer with 'kani' written on his sleeve stood for the soon-to-be-appointed thirteenth shogun, Iesada (1824-1858), a sickly individual nicknamed 'Kani Kubō' (Nervous Kid Shogun)? Could Wisteria Maiden (Fuji-musume) be Lady Fujinoe, a powerful figure in the shogun's harem. And the Monkey and Catfish symbolise the Americans? Fujiokaya nikki offers detailed explanations of the hidden meaning of each figure, but another contemporary source provides quite different interpretations. 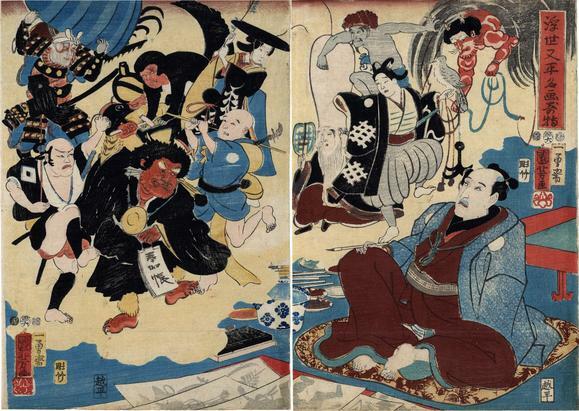 As with the Earth Spider triptych, the authorities were alarmed not only by the question of who was 'really' represented, but also by the generally unsettling effect of the 'false rumours' (fuhyō) the image generated in the eighth month of 1853 they overrode the censor's approval and ordered the publisher to cease selling the prints and to destroy both the blocks and any remaining stocks. The operating censors were all dismissed and replaced. A later document records that Kuniyoshi and his publisher were fined, but City Prosecutions mentions no such punishment." Also illustrated in 歌川国芳展: 生誕200年記念 Utagawa Kuniyoshi: Exhibition to Commemorate the 200th Anniversary of his birth, 1996, #273, p. 188. There is another copy of this diptych in the Hachinohe Clinic Machikado Museum and in the Ishibi Prefectural Museum.